We’re traveling around the world on a budget. Granted, it’s not a super-tight budget that forces us to stay in crowded and dirty hostels, but we’re not staying in 5-star hotels either. We very often have to choose which activities we’ll splurge on and which ones we’ll save for another day. If there’s anything I can’t seem to resist, however, it’s climbing behind the wheel of a ridiculously expensive sports car and taking it for a spin. Sadly, long-term travel budgets and this type of activity are pretty much incompatible. I already blew 100€ ($140) for a 13-minute drive in a Ferrari in Italy in June, and that was painful enough – though totally worth it. But midway through October, our travels took us from Istanbul to Kochi, India, with an 18-hour layover in Abu Dhabi, site of a brand new Formula One racetrack and a plethora of gasoline-fueled activities at the Yas Marina Driving School. Oh, the horror! 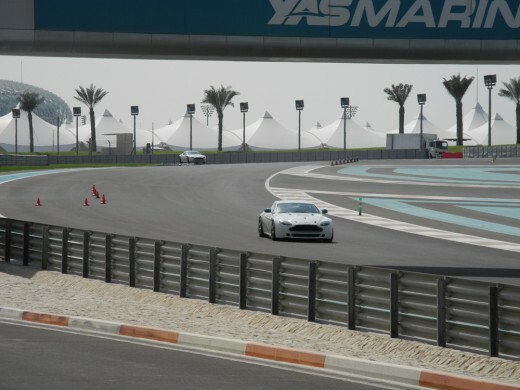 In that 18-hour period, I managed to break most of our budget rules: I used Hotels.com to book us a room at the 5-star Yas Hotel (which was actually quite reasonable), and booked myself into the Aston Martin Driving Experience at the racetrack. The Yas is a gaudy take on a typical “W” hotel. It’s clad in an ever-changing cloak of pink and purple LED lights, and the lobby is the kind of space that would give Philippe Starck a woody. Rooms are huge and filled with trendy gadgets such as motorized drapes, lighting “themes”, furniture straight out of The Jetsons, and Nespresso machines. 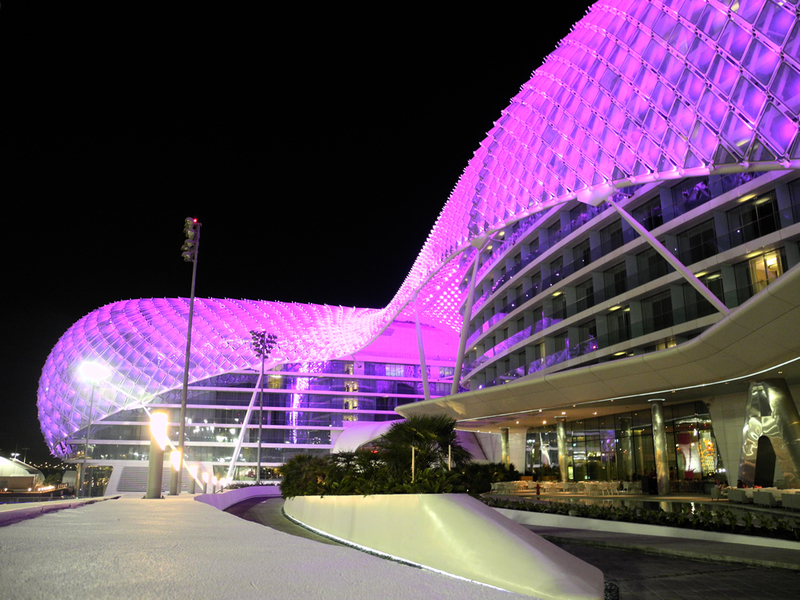 The Yas Hotel at night. Sometimes it's pink, sometimes it's purple or blue. 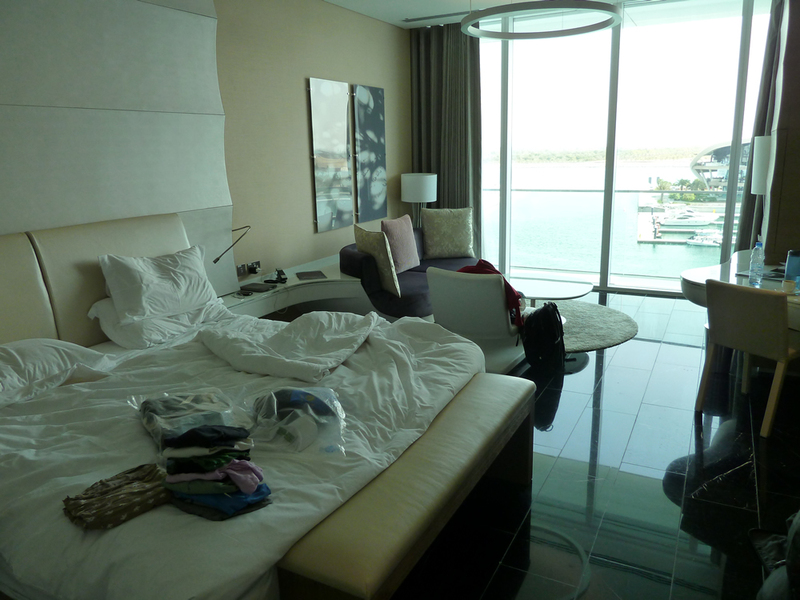 1/3 view of our HUGE room. 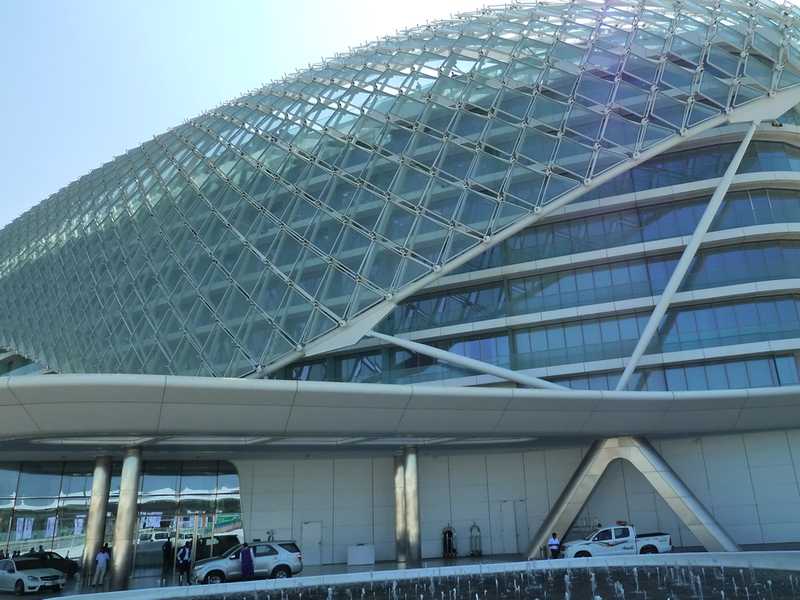 The Yas Hotel in the daytime. We made it to the hotel at about 4:00 in the morning, so I slept until 8:30 and then prepared for my driving lesson. I went downstairs and collected my ticket from the ticket office, had breakfast with Robin, and hopped in a cab to travel 3 km to the track’s driving school (the hotel itself actually straddles the F1 track, though that particular portion was closed for repairs ahead of the F1 race on November 13). 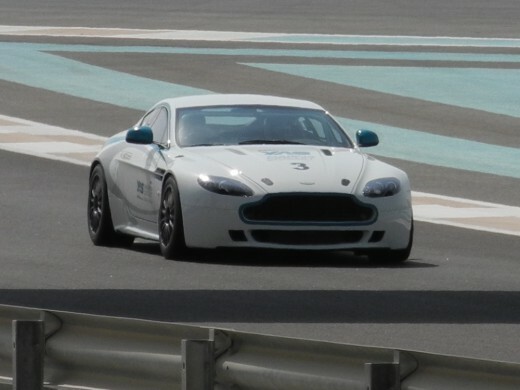 At the school, my 5-person group received a brief bit of classroom training from a traditionally-dressed Emirati (robe, sandals, and all) and then went out to see the cars: 5 race-ready Aston Martin V8 Vantages with everything you’d expect from a real racecar (5-point seatbelts, roll cage, removable steering wheel, and, uh, air conditioning. It’s Abu Dhabi. It gets hot). Everyone put on their balaclavas, helmets, and gloves, and climbed into their respective cars. 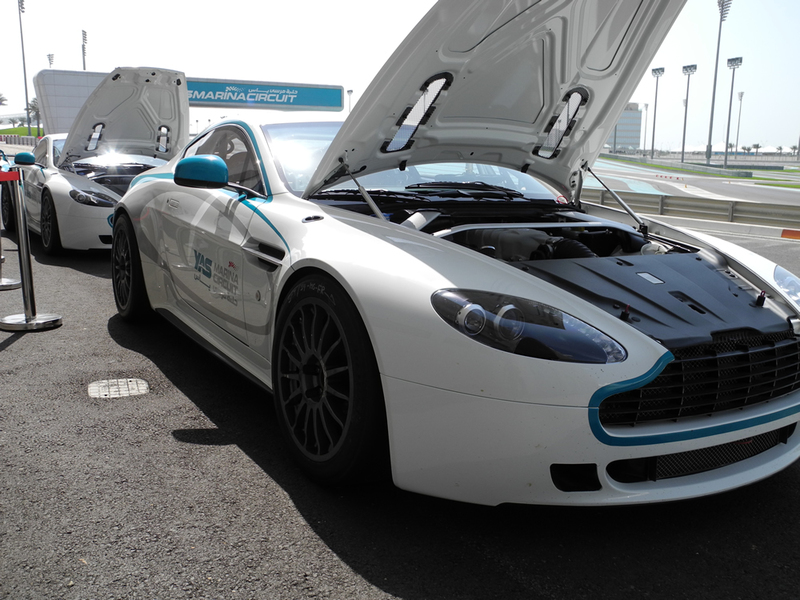 Aston Martin Vantage, almost ready to go. 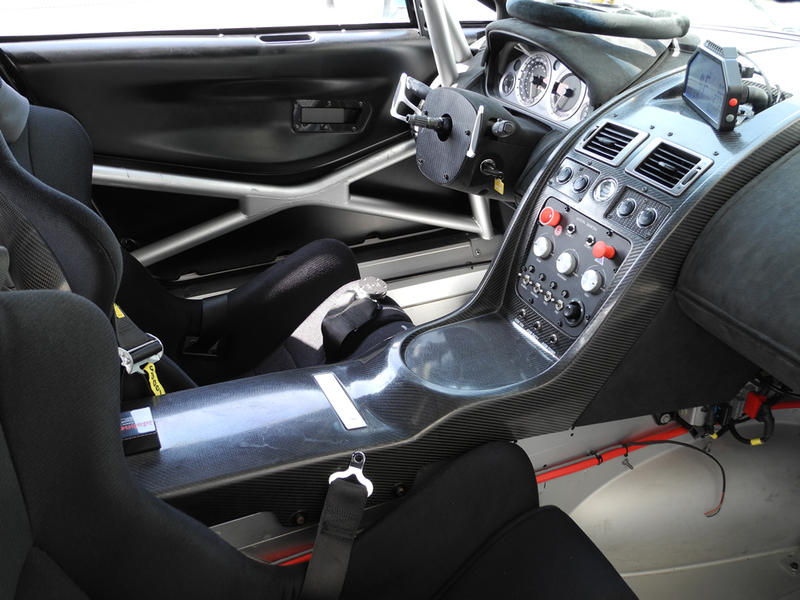 Interior of the car. Where's the steering wheel? Sitting on the dash! 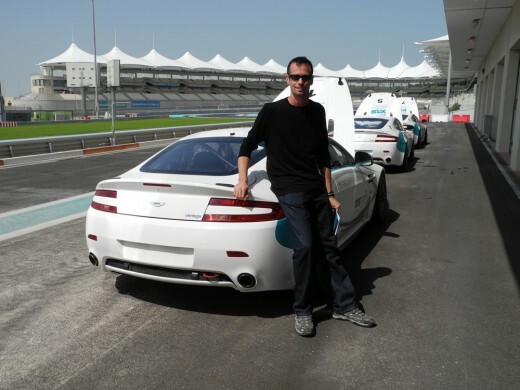 While awaiting my instructor, I tapped the gas pedal to rev the engine a bit, but the tachometer barely budged. I tapped the pedal again. Nothing. Hmmm… I figured it had a bit of slack. I stepped on it a little harder and the tachometer responded with a little blip barely above 1000 rpm. OK, I thought, I just have to give it a bit of gas when it’s time to go. 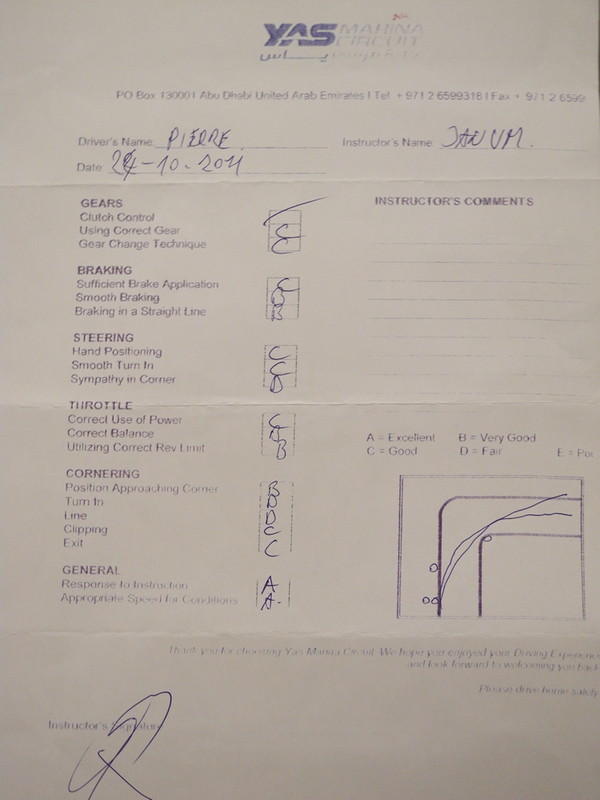 Lap #1 was purposefully slow, and my instructor indicated the proper lines to take around each corner, which gear to use when entering each turn, what line to follow while exiting, and where the braking points and turning points were located. Then I slowly started to increase the speed. The V8 had a loud, deep roar that made any conversation impossible – hand signals were the only way to communicate in the car. We ran through 4 or 5 laps and my instructor relentlessly pointed out my mistakes: missed gear changes, incorrect lines, poor positioning on the exit to just about every single turn, etc. I felt like a 16-year-old kid in Driver’s Ed. Still, I was hitting over 220 km/hr (137 mph) on the straightaway, slamming on the brakes and downshifting from 5th or 6th into 2nd, diving into 2 back-to-back 90-degree turns at 40 mph, and sweating like a pig the entire time. This was a blast! 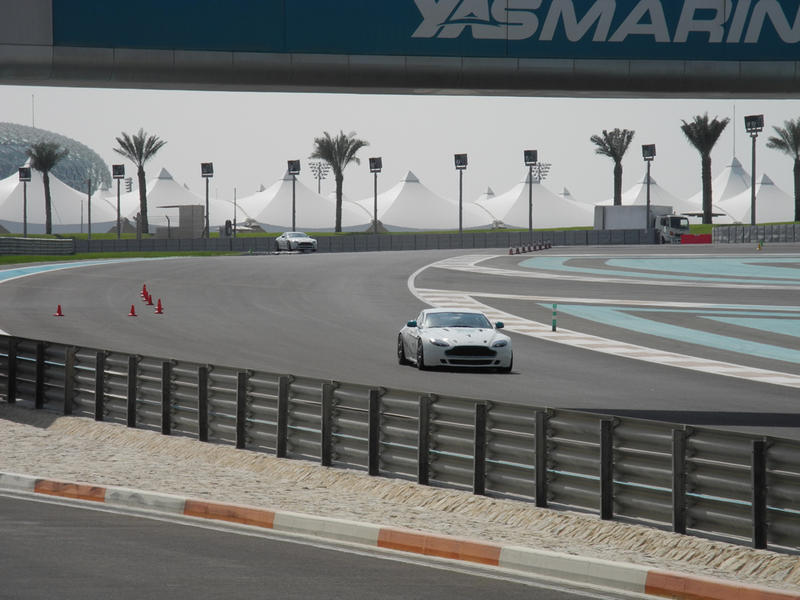 Aston Martin driving on the F1 track. If the video below is not displaying properly, refresh your browser! After a 10-minute pit-stop where my instructor gave me a few more pointers, we headed back onto the track for another session. 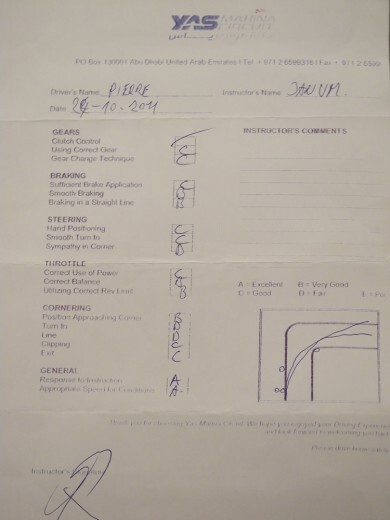 I was a lot more aggressive and revved the engine much closer to its 7500 rpm limit, but was still incapable of exiting turns properly (it’s a lot tougher than you might think) and my lines were crap. 5 laps later, it was time for the final debrief. The verdict: Not so great. I got a few B’s, but mostly C’s and D’s. A few of my classmates passed me on the track, and I felt kinda slow. What crappy grades! My mom will be horrified. Soaked in sweat, but pretty happy. Way to go, Speed Racer. That sure beats Judy’s 135 kph on the Autostrata in a Smartcar for two!